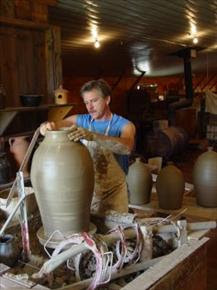 Folk potter Michael Crocker taps a thick stack of back orders for his snake jugs and face jugs. "You can't rush clay," he grins. "You can't rush art either." At 39, Michael creates his collectibles carefully, all the while fulfilling the goal of carrying on tradition. "It would fascinate me so much I couldn't stand it," he says of his childhood days hanging around a nearby pottery shop where, at 12, he was invited to work. "I'd go before school, then go back to work after school," reports the Lula-based potter who absorbed the techniques of older craftspeople. "Later I saw that a window to the past was slip ping away, and I felt the desire to continue it in the future." A face jug easily brings $600; the snake jugs, executed with slender North Georgia forms and ash glazes, fetch even more. The Smithsonian Institution owns some Crocker pottery. Michael Crocker himself collects pieces from past generations. "I would do this even if there was no money," he admits. "I want to make pottery--and my son who is 6 is already making pieces." With that thought, Michael smiles. The show, he knows, will go on.